This cake was in Bon Appetit's December 2004 issue, and it's only now that I've gotten around to making it. The recipe is at Epicurious. I was sort of hoping to be able to post pictures with this recipe, since there are so many parts to it... but in the end, that's why I didn't take pictures as I was making it: it's a lot of stuff to juggle, and since I made it all in one evening (rather than spreading it out over a couple of days like the recipe advises), I opted to forego the pictures. Maybe the next time I have a visitor I'll draft him or her to be my photographer. So, anyway, you just get a picture of the final product, which I'll put at the end of this post. In the meantime, I ought to make a few notes on changes I made to the recipe. The first is that, despite the fact that I *know* I'm a good baker, the recipe they give for the cake layer totally failed in my otherwise capable hands. Well, maybe not totally--but it failed in a very crucial way, and not in the way I expected it to fail. The recipe calls for clarifying the butter, which sort of threw me for a loop. I'd never clarified butter before, so even though they describe what to do, I ran, panicked, to my trusted copy of Julia Child's Mastering the Art of French Cooking and looked up clarified butter. Good explanation of what it is, why you do it, and how you do it, but as I suspected, she did not list "cake" as one of the ways you can use it. That's not to say, of course, that one cannot use clarified butter in a cake. I've just never seen a recipe that called for it, until now. But that's beside the point. The cake I was instructed to make was a genoise which I've made before with okay success. It was a little gummy, but nobody seemed to know the difference. With this recipe, I didn't even get to the point of completing the batter and sticking it in the oven. You're supposed to beat the eggs with the sugar in a double boiler until they warm up to around 105F, which I did. You're then supposed to use an electric mixer to beat the eggs for several minutes until they cool and triple in volume. Now, I don't know about you, but when it comes to estimating change in volume, especially that of liquidy things that sort of just barely cover the base of a bowl, I'm useless. And unfortunately for me, the recipe gave no other indication of the proper level of beating, other than that a time estimate, and that the eggs should cool and triple in volume. Some guidelines on color, texture, etc. would have been much more helpful, at least to me, but I still feel that I ought to have been able to manage without them, as I have in the past. No such luck. I had been beating my eggs for a while longer than was called for, and they still looked pretty liquidy, but it looked like they might have tripled in volume. Maybe. I don't really know. Anyway, so despite my reservations about the liquidy nature of my eggs, I moved on to the next stage of the recipe, adding the dry ingredients, and it was a mess. You know what I'm talking about, the kind of gummy, inhomogeneous mess that results when you add dry powder to a liquidy mixture. This is why when you make hot cocoa from a mix, you always put the mix in the mug and then add the hot water or milk--never the other way around. It's like that old chemistry saying: "do as you otter, add acid to water," only in this case nothing will blow up if you do it the wrong way around. But chemistry mishaps aside, when I tried to fold the flour and cocoa powder into the egg mixture--and there's a big red flag right there: folding is used as an alternative to plain stirring, in order to maintain volume in one or both of the components to be combined, and if neither of your components is fluffy (witness the liquidy, decidedly non-fluffy eggs and the powdery flour and cocoa), something's wrong--what I got was gunk. The powder absorbed some of the liquid from the eggs, but not much, and turned into gunk. Gunk on the spatula, gunk on the sides of the bowls, you get the idea. So, I decided to scrap it and substitute another kind of chocolate cake. In the end, it was for the best: genoise is a rather dry sort of cake, and the recipe as it's written calls for liqueur (Tuaca or Frangelico) to be brushed over the baked cake layer before the addition of the mousse, the idea being that the liqueur moistens it. Since I'm a grad student on a budget, I wasn't about to go out and buy a bottle of expensive liqueur, so the genoise all by itself would probably have ended up too dry, anyway. So, I didn't feel too bad about using a different kind of cake. The recipe I chose to substitute is one from the February 2004 Gourmet (at Epicurious). It is my favorite chocolate cake recipe ever, and it has consistently given me light, soft, moist results--perfect, I thought, to go with the mousse. So I went and got the requisite buttermilk (what is it about buttermilk that makes cakes so wonderfully fluffy and soft?) and made a half batch, or one layer. It came out perfect, and I had a great time munching on the scraps that I got from cutting off the crusty sides and slightly uneven top. Mmmm... chocolate cake. So, that was my adventure with the cake. The other change I decided to make was in the decoration of the assembled cake. The original recipe has you sift cocoa powder over the top of the cake, and then use a stencil to sift powdered sugar over it in the form of snowflakes or stars, or whatever. Since it's the day after Valentine's Day, I decided to do hearts--in chocolate, instead of powdered sugar. My adventures with that element of the cake can be found here. That looks seriously tasty. 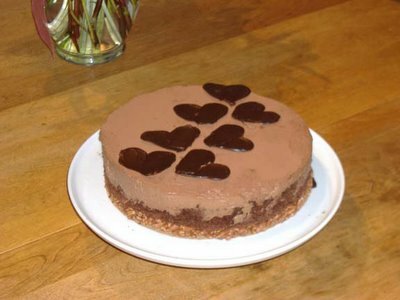 :) Really clever to use the spatula to make the hearts, too, I would never have thought of that. I just started up a new blog that seems to have quite a bit in common with yours... just wanted to stop by, say hi and let you know I linked you.